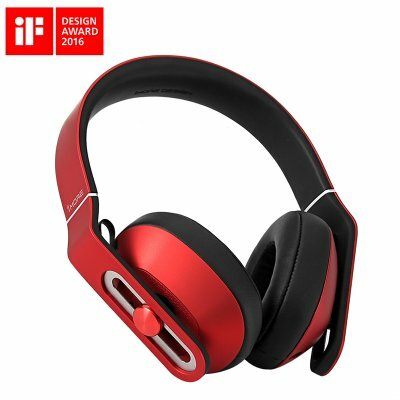 Successfully Added 1More MK801 Over-Ear Headphones - Call Control + Mic, 32Ohm, 104dB, Adjustable Headband to your Shopping Cart. The 1More MK801 headphones from Xiaomi are barging headphones and a sure contender for the best headphones for under $100. With their natural timber and high quality play back the 1more headphones really impress, but then that is exactly what you'd expect from an audio device tuned by a Grammy Award winning mixer Luca Bignardi. The elegant style with a bold red color is very attractive and the use of a strong yet flexible light weight TR90 titanium steal brings great durability. The ear cups rotate in 4 directions and with an adjustable slider offer a precision fit that is comfortable for all. The ear cups are also covered with a soft PU leather while the headband has a soft rubber coating making them both soft and easy to clean. The dual in line remote is compatible with both Android and iOS so playback and call answering is within easy reach. With a tough headband and sturdy design the 1More MK801 over ear headphones exude a premium quality at an affordable price. If you're looking for a lively and dynamic performance with decent base and richly balanced midranges then the 1More MK801 over ear headphones are an ideal choice. The 1More MK801 comes with 12 months warranty, brought to you by the leader in electronic devices as well as wholesale headphones and earphones..
Answer or end phone call, pause or play music and also volume control. Full compatible with Android / iOS.